Hostwinds.com is a multiple award winning client-centered web hosting company located in the United States (US) of America. The web hosting and VPS provider was founded in the year 2010 in the US. It was originally established in Tulsa, Oklahoma but today their headquarters are at their second office, in Seattle. More so, Hostwinds.com has two data centres, one in Dallas, the other in Seattle, which helps to provide customers with recovery of data in cases of disaster. Since inception, Hostwinds has been solely owned and managed by the CEO, Peter Holden. The company has a staff base of 11-50 employees that are selfless, hardworking and professional, thereby helping this organization provide high quality web hosting services alongside unbeatable customer service and support. They specialize majorly on web hosting but offer a wide range of other services including VPS hosting, dedicated servers, Windows VPS, unlimited hosting, Minecraft servers and Virtual private network (VPN) services. With the use of advanced system servers via latest technologies, Hostwinds’ servers have high performances and system stability. As an example, these servers have fail-proof that easily help in data recovery should there be network failures, your website remains unaffected and therefore stays actively online. As earlier mentioned, Hostwinds offer a range of interesting services such as unlimited hosting, reseller hosting, VPS hosting, windows VPS etc. The unlimited hosting gives clients unlimited bandwidth, unlimited disk space and domains, albeit, these offers are dependent on the plan of choice, be it basic, advanced or ultimate plan. Using the reseller hosting, you enjoy instant setup, unlimited subdomains and also comes with increasing profit as you buy more of these accounts. This comes with nightly backups and full management and technical support is made available at all times. This offers a stable system while additional features such as disk space, CPU core, bandwidth size etc. are plan dependent. This plan helps you in establishing a secure connection, thereby protecting your site from external harm. This is a major specialty of hosting company. If you need sophisticated hardware, unrivaled support, then the VPS package is optimal. For VPS, the customer enjoys full management from the parent company, instant setup, daily backups, solid state drives and of course ever ready and available technical support. Unlike other products, the VPS enables usage across multiple locations, free snapshots, DDOS protection, free website transfers, solid state drives and surely 100% satisfaction guarantee. In a similar manner to others, the company offers several VPS packages at increasing prices and more sophisticated features at each higher plan. Like the dedicated servers, Windows VPS gives plan-dependent features. It is a good choice if you need more disk space for your website. The windows VPS utilizes the latest hardware accompanied by effective features and entirely managed by their team of staffs. This offer comes with instant setup; nightly backups that gets your data stored in the data base each and every night, hence, gives you less to worry about and you are on your way to a sound sleep at night. Additionally, your windows server is setup for cloud control, thereby giving you access to it from wherever you are. This VPS type also gives room for addition of RAM or CPU core anytime you so wish. Hence, your server can be modified or upgraded to meet your personal requirements at one’s will, thanks to the instant scalability feature. So as your website grows, you can increase the RAM from just 8 GB to 96 GB. Likewise, the disk space can be increased from 150 GB to 750 GB. This server also enjoys full-time monitoring by dedicated team of Hostwinds, thereby ensure optimum performance. More so, unexpected problems are fixed quickly in order to ensure you run hitch-free at all times. Hostwinds Windows VPS is available in 4 different packages; the first package costs $16.99 monthly and offers 1 CPU core, 1 GB RAM, 30 GB disk space, 1 TB / 1 Gbps port. The second package costs $27.99 per month having similar features as the first package, only that this has 30 GB disk space and 2 TB / 1 Gbps port. The third package goes for $45.99 per month. It comes with 2 CPU cores, 4 GB RAM, 75 GB disk space and a 2 TB / 1 Gbps port. The fourth package however comes with 2 CPU cores, 6GB RAM, 100 GB disk space and 2 TB / 1 Gbps port, all for a monthly charge of $56.99. Linux VPS is the most commonly used operating system for web hosting globally and their servers are a preferred choice for numerous applications and websites. 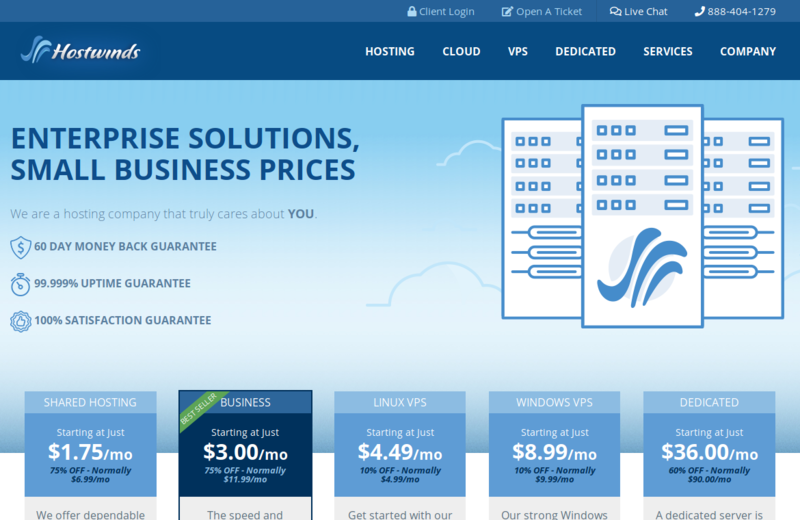 Besides, it is usually cheaper than the Windows VPS. The Linus VPS like the windows VPS also utilizes the latest hardware technology with full management by dedicated team of the Hostwinds. Similarly, the Linux VPS comes in different packages. The first package at a monthly price of $10.99 has hardware features of 1 CPU core, 1 GB RAM, 30 GB disk space and 1 TB / 1 Gbps port. The second package offers features of 1 CPU core, 2 GB RAM, 50 GB disk space and a 2 TB / 1 Gbps port, for a monthly price of $21.99. The third package costs $39.99 per month. It offers 2 CPU cores, 4 GB RAM, 75 GB disk space and a bandwidth of 2 TB / 1 Gbps port. The fourth package has hardware features of 2 CPU cores, 6 GB RAM, 100 GB disk space and 2 TB / 1 Gbps port which costs $50.99 per month. By the way, all the VPS packages come with fascinating discount offers to give you 100% satisfaction. The cloud hosting packages include a lot of features. One of them is the ability to choose between hourly and monthly billing which is a great benefit for customers who don’t need hostwinds’ services all the time. In case you use their cloud server only for applications that are needed once a week or couple of times a month, it makes sense to just pay for those hours which might be way less than the monthly cap. For customers who don’t want the hustle of caring for the server themselves or who simply don’t have the technical knowledge to do so hostwinds of course offers fully managed solutions. For extra fast systems they have SSDs like at every state-of-the-art web hosting service. Even the usage of the server gets simplified by customized server templates that are especially easy to use. For secure server connections Hostwinds offers automatic SSH key deployment which means that the data connection for you to your server will be encrypted. Also their cloud systems are easily scalable, so if the required capacities of your projects change, you can upgrade to higher performance at any given point. The same count for downgrades in case less performance would seem to be sufficient. One important point is backups. So of course Hostwinds offers backups and system snapshots to make sure your data will definitely never get lost. Dedicated servers are servers that are rented in their entirety, so the hardware won’t be shared as on cloud server solutions. A dedicated server will be all yours as long as you rent it. This means that those servers provide the highest performance and therefore are the priciest ones. On the case of Hostwinds.com dedicated servers start at $106/month. However, at the moment they have an extraordinary discount of more than 50% so they offer dedicated servers starting from $42.40 per month. Which is a remarkable offer you should consider using. Hostwinds also offers e-commerce systems such as CPV Lab to meet your marketing needs. Additionally, there is the blog system using the WordPress hosting platform. Other scripts include Vbulletin, Magneto, Drupal etc. However, these come with additional charges within $21.99 and $224.99 monthly for the CPVLAB, while WordPress costs additional charges between $6.99 and $10.99 for the basic and ultimate plans. With Hostwinds, you can be sure of unrivaled customer support. They offer 24/7 customer and tech support through the different platforms on their website ranging from live chat, phone calls whether you are new and do not have an account yet. Additionally, they support contact through e-mail and support ticket all available on the website, likewise you can reach them on different social media platforms such as Twitter, Facebook and LinkedIn network. The best part of the contact support is the swift response time. Hostwinds offer money back guarantee. Hence, if you are not satisfied with their services, you will get a refund within 60 days of opening the account with them without any form of questioning. Based on a number of reviews on platforms such as www.hostadvice.com and www.whoishostingthis.com, Hostwinds rates high as a large chunk of users gives the provider a very high rating, more specifically on their 24/7 Tech and support with arguably the best response time you can get anywhere in the world. Additionally, users have shown to enjoy the robust nature of the company in that they offer wide range of services especially the reseller hosting or the white labeling offer which gives users freedom to sell services under their personal brand. Other enticing offers customers tend to praise is the flexibility of the company to cater for small business owners, non-profit organizations, WordPress users as well as managed and unmanaged VPS clients. However, a number of complaints have been made based on the prices of their products and services compared to other VPS providers. Based on customer reviews so far, Hostwinds is a choice VPS provider due to its reliability as it utilizes the latest hardware technology alongside 24/7 Tech and customer support enabled by the dedicated members of staff to give your website or blog the optimum performance and security. However, the prices that come with each package need to be reviewed to cater for individuals of all social status.